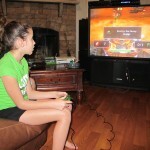 Clueless me had no idea how excited the kids would be over the XBox 360 Game, Skylanders: Spyro’s Adventure. As soon as I told them we were getting the game for review, they began chatting non-stop about Spyro. Clearly I have been living under a rock, as I was totally unaware of this Spyro phenomenon….